"Image-Based Modeling of PSF Deformation With Application to Limited Angle PET Data"
"Special Nuclear Material Characterization Using Digital 3-D Position Sensitive CdZnTe Detectors and High Purity Germanium Spectrometers"
MR Performance Comparison of a PET/MR System Before and After SiPM-Based Time-of-Flight PET Detector Insertion . . . . . . . . . . . . . . . . .
Iterative Structural and Functional Synergistic Resolution Recovery (iSFS-RR) Applied to PET-MR Images in Epilepsy . . . . . . . . . . . . . . . . . . .
MR-Consistent Simultaneous Reconstruction of Attenuation and Activity for Non-TOF PET/MR . . . . . . . . . . . . . . . . . . . . . . . . . . . . . . . . . . . . .
Tissue Probability-Based Attenuation Correction for Brain PET/MR by Using SPM8 . . . . . . . . . . . . . . . . . . . . . . . . . . . . . . . . . . . . . . . . . . . . . . . Improved Parameter-Estimation With MRI-Constrained PET Kinetic Modeling: A Simulation Study . . . . . . . . . . . . . . . . . . . . . . . . . . . . . . . . . . .
A PET Design Based on SiPM and Monolithic LYSO Crystals: Performance Evaluation . . . . . . . . . . . . . . . . . . . . . . . . . . . . . . . . . . . . . . . . . . . . . Pilot Studies With BGO Scintillators Coupled to Low-Noise, Large-Area, SiPM Arrays . . . . . . . . . . . . . . . . . . . . . . . . . . . . . . . . . . . . . . . . . . . . . . .
A Novel Method for γ-photons Depth-of-Interaction Detection in Monolithic Scintillation Crystals . . . . . . . . . . . . . . . . . . . . . . . . . . . . . . . . . . . . . . .
Energy Resolution of Ce:GAGG and Pr:LuAG Scintillators Coupled to 3 mm × 3 mm Silicon Photomultipliers . . . . . . . . . . . . . . . . . . . . . . . . . . . . Crystal Identification in Dual-Layer-Offset DOI-PET Detectors Using Stratified Peak Tracking Based on SVD and Mean-Shift Algorithm . . . . . . .
Development of a DOI PET Detector Having the Structure of the X'tal Cube Extended in One Direction . . . . . . . . . . . . . . . . . . . . . . . . . . . . . . . .
Optimization of Parallel-Hole Collimators for Intraoperative Localization of Iodine-125 Seeds . . . . . . . . . . . . . . . . . . . . . . . . . . . . . . . . . . . . . . . . .
An Intraoperative β- Detecting Probe for Radio-Guided Surgery in Tumour Resection . . . . . . . . . . . . . . . . . . . . . . . . . . . . . . . . . . . . . . . . . . . . . .
Impacts of Intelligent Automated Quality Control on a Small Animal APD-Based Digital PET Scanner . . . . . . . . . . . . . . . . . . . . . . . . . . . . . . . . . . Measuring the Mutual Effects of a CZT Detector and a 3T MRI for the Development of a Simultaneous MBI/MRI Insert . . . . . . . . . . . . . . . . . . . .
Computed Tomography Sinogram Inpainting With Compound Prior Modelling Both Sinogram and Image Sparsity . . . . . . . . . . . . . . . . . . . . . . . . Noise Reduction in Small Animal PET Images Using a Variational Non-Convex Functional . . . . . . . . . . . . . . . . . . . . . . . . . . . . . . . . . . . . . . . . . . .
A 3.9 ps Time-Interval RMS Precision Time-to-Digital Converter Using a Dual-Sampling Method in an UltraScale FPGA . . . . . . . . . . . . . . . . . . .
Ultra-Low Power Fast Multi-Channel 10-Bit ADC ASIC for Readout of Particle Physics Detectors . . . . . . . . . . . . . . . . . . . . . . . . . . . . . . . . . . . .
A 4.2 ps Time-Interval RMS Resolution Time-to-Digital Converter Using a Bin Decimation Method in an UltraScale FPGA . . . . . . . . . . . . . . . . .
Tellurium Secondary-Phase Defects in CdZnTe and their Association With the 1.1-eV Deep Trap . . . . . . . . . . . . . . . . . . . . . . . . . . . . . . . . . . . . .
Estimation of Nuclear Counting by a Nonlinear Filter Based on a Hypothesis Test and a Double Exponential Smoothing . . . . . . . . . . . . . . . . . . . Coordination Control of SMR-Based NSSS Modules Integrated by Feedwater Distribution . . . . . . . . . . . . . . . . . . . . . . . . . . . . . . . . . . . . . . . . . . .
Development of Radiation-Resistant In-Water Wireless Transmission System Using Light Emitting Diodes and Photo Diodes . 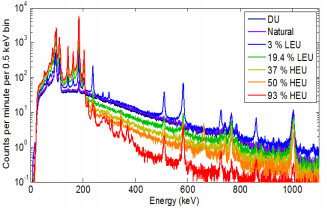 . . . . . . . . . . . . . .
A New Perspective on Protection of Nuclear Reactor Surfaces From High Energy Plasma Irradiation by Equilibrium Reconstruction . . . . . . . . . . Discussion on Non-Linear Conductivity Characteristics With Space Charge Behavior of Modified Epoxy for Spacecraft . . . . . . . . . . . . . . . . . . . .
A Thermoelectric Energy Harvesting System for Powering Wireless Sensors in Nuclear Power Plants . . . . . . . . . . . . . . . . . . . . . . . . . . . . . . . . . . Correction to "Synergistic Effect of Ionization and Displacement Damage in NPN Transistors Caused by Protons With Various Energies" . . . . . . Copyright 2016 IEEE - All rights reserved. Use of this newsletter site signifies your agreement to the IEEE Terms and Conditions.